"Excess profits" at the banks are harming Canada's economy, Democracy Watch says. 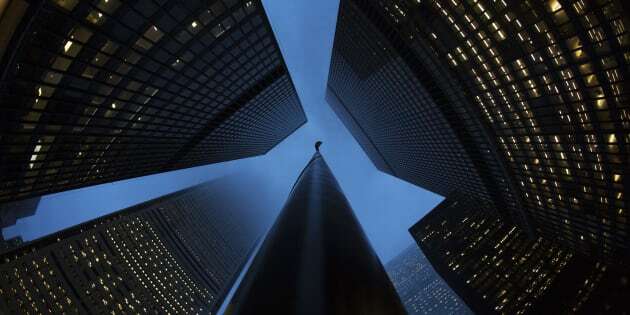 The headquarters of several of Canada's largest banks in Toronto's financial district, Jan. 28, 2013. A prominent policy watchdog group is calling on Canada to toughen banking oversight, saying the banks' record profits this year are a sign it's time to stop "gouging and abuse." A prominent policy watchdog group is calling on Canada to toughen banking oversight, saying the banks' record profits this year are a sign it's time to stop "gouging and abuse." The big six banks just finished reporting their fourth-quarter earnings, and according to calculations by Democracy Watch, they earned $42 billion in profit collectively in fiscal 2017. That's a 13-per-cent increase over the previous year and double the profits the banks made as recently as 2010. Flush with cash, the banks set aside $14.3 billion for bonuses this year, an 11-per-cent increase from the year before, Bloomberg reports. They achieved those profits "in part by firing thousands of people, cutting services, and hiking fees and credit card interest rates," Democracy Watch said in a statement issued Wednesday. The banks would dispute that assessment. Analysts attribute their success to a broad-based economic expansion in North America this year, which saw Canada's economy grow at the fastest pace since the financial crisis of 2008-09. TD Bank and CIBC, in particular, pointed to their U.S. divisions as driving profit growth. "U.S. commercial banking and wealth management continue to exceed our expectations," CIBC chief executive Victor Dodig said during an earnings call last week. But Duff Conacher, co-founder of Democracy Watch, noted that the banks have also been hiking customer fees and have engaged in aggressive cost-cutting, including mass closures of bank branches. "Every dollar of excess profits [at the banks] costs the Canadian economy, choking off spending and job creation," Conacher told HuffPost Canada in an interview. Among other things, the group is calling for Canada to follow Australia's lead and launch a federal inquiry into bank profits. It also wants the Financial Consumer Agency of Canada (FCAC) to do unannounced "mystery shopper" audits of banking services, to ensure banks are complying with the law. If the government starts carrying out audits of the banks, "they will find gouging for sure," Conacher said. He defines gouging as earning more than 15 per cent profit on a banking service. Conacher says he expects the audits to find bank divisions making 1,000- or even 2,000-per-cent profit. He cites an unnamed industry insider who estimated that it costs banks 20 cents to allow customers to use another bank's machines; fees in Canada today for that service are in the $3 range. "No business has a right to gouge, especially a business providing an essential service," Conacher said. And banking, he argues, is an essential service: "You need a bank account, and arguably a credit card, to function today." Conacher points to an investigation by the CBC this spring, in which employees at all the major banks said they were pressured to "upsell, trick and even lie to customers to meet unrealistic sales targets and keep their jobs." In some cases, customers were moved to higher-fee accounts without their knowledge, the CBC reported. "The fact that the media revealed the latest wrongdoing by the banks instead of the Financial Consumer Agency of Canada shows that the agency is a lapdog, not an effective watchdog," Conacher said. In the wake of those news reports, the FCAC announced in advance that it would be investigating banks' selling practices — a move Conacher says was a mistake. "The FCAC made a big mistake announcing an inspection a month in advance as they tipped off the banks and gave them time to cover up and clean up their wrongdoing," Conacher said in a statement. "It's as bad as the police giving advance notice that they are setting up a speed trap on a highway — you don't catch anyone violating the law that way." Democracy Watch says the FCAC has issued just $1.7 million in fines to banks since 2001. By comparison, Britain's Financial Conduct Authority has issued penalties totaling more than US$3 billion since its creation in 2013, while in the U.S. the Consumer Financial Protection Bureau (CFPB) has issued more than US$5 billion in fines since 2011. A cap on profit margins? Conacher is putting pressure on the federal Liberals to take action. He says the top priority should be legislation that would create a consumer-funded banking watchdog. Banks would be required to notify customers of its existence. The group is also calling for legislation that would require banks to lower prices or interest rates in divisions where profit margins are above 15 per cent. But Conacher says such legislation would be unnecessary if banks' earnings were audited and made public — they would lower prices themselves. "What are the Liberals doing? Are they going to do anything to prevent gouging and abuse?" Conacher asks.